The marinade and cut of beef used in London broil varies regionally. On the East Coast you'll likely get a classic Worcestershire sauce-based marinated flank steak. And on the West coast you may get an ancho chile and lime-cilantro marinated top round. That the fun of London broil. It isn't a set-in-stone recipe, but it has to meet a few requirements. The classic cut is flank steak, but top round is sometimes used -- both notoriously tough but famously flavorful. The steak also must be marinated then broiled or grilled. Turning the flank steak into the tender London broil you know and love entails a four-step process. 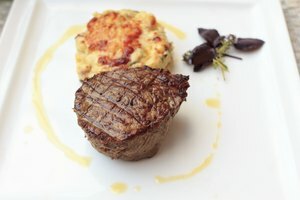 A technique called "jaccarding" tenderizes steak in the simplest way possible: By cutting connective tissue in pieces so small it renders them undetectable during chewing. Blade tenderizers, informally referred to as jaccards, have rows of razor-thin knives aligned to pierce meat uniformly. Jaccarding is reserved for tough cuts like London broil -- you'd never subject a naturally tender cut like filet or ribeye to blade tenderization because it's unnecessary and mars the aesthetics of the cut. 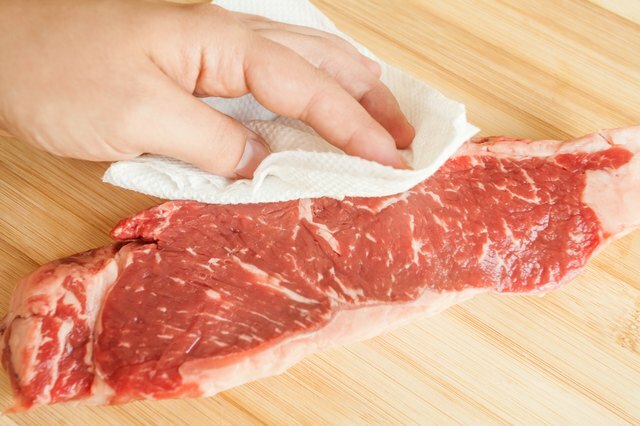 Pat the steak dry with paper towels and lay it on the cutting board. Place the blade tenderizer about 1/4 inch from either side and press down on the device at intervals of 1/2 to 1 inch until you reach the other side. You don't have to press forcefully; the blades do their job with little effort. Turn the steak over and repeat on the other side. If the steak is more than 1/2 inch thick, tenderize it a second time. The marinade in London broil is mainly for flavoring. It provides a modicum of tenderization but not enough to tenderize the steak on its own. But, when used in combination with blade tenderization and applied at least 40 minutes before cooking, the sodium comes in direct contact with the connective tissue and starts to denature it, or break it down. When applied for 12 hours, the connective tissue breaks down as much as it's going to -- any longer and the meat itself starts to degrade. 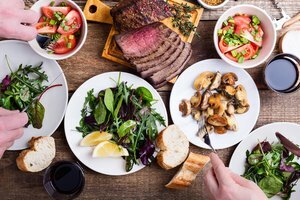 Classic London broil typically gets a Worcestershire-based marinade, but any marinade will do if it has an acidic component. Mix 3 parts oil and 1 part each flavored vinegar and Worcestershire sauce to make the marinade base. Next, add the aromatics of choice -- garlic, scallions and ginger, for example; it's your call. Season the marinade to taste with fresh herbs and kosher salt. 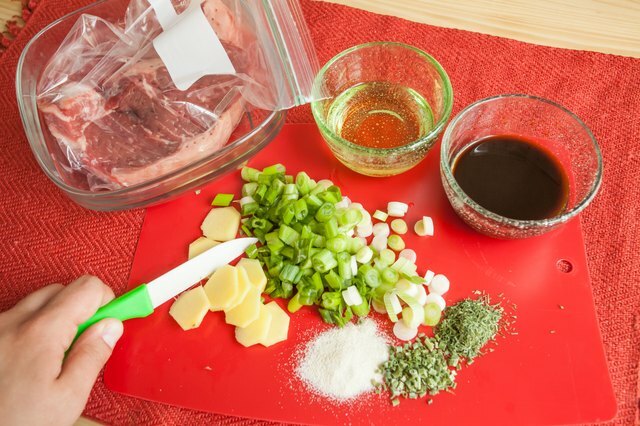 Place the London broil in a sealable food bag and pour the marinade over it. Seal the bag, place it in a shallow dish and marinate the steak for 12 hours. The less time a steak cooks, the less water it loses. The less water a steak loses, the less its protein strands constrict. The less its protein strands constrict and shorten, the more tender it is. It's that simple. In restaurants, London broil only gets cooked past medium rare at customer request. The U.S. Department of Agriculture advises cooking beef to 145 degrees Fahrenheit, or almost medium well. 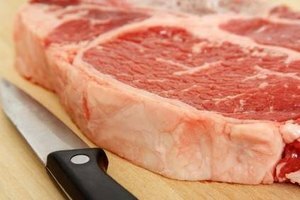 If you purchase steak from a quality retailer you have little to worry about, unless you're pregnant, elderly, under 13 years old or have an immune disorder. London broil needs to be cooked quickly under the broiler or on a hot grill, 4 to 5 minutes on each side, to reach medium rare. Resting is perhaps the most neglected step in cooking steak. A close second, for tough meats, is slicing across the grain. Slicing across the grain isn't a tenderization technique, per se -- it essentially shortens long protein strands into small ones so they are easier to chew. 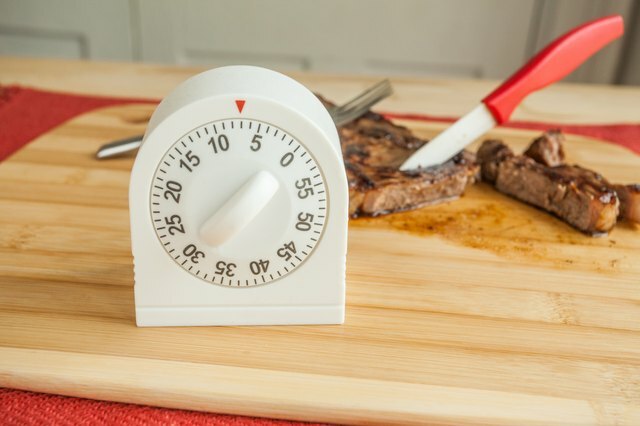 After you take the London broil out of the oven or off the grill, let it rest for 8 minutes per pound. While at rest, the meat continues cooking and the protein strands relax slightly -- they don't if you slice into the meat too soon. 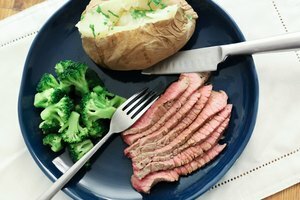 When the London broil finishes cooking, lay it on a carving board or a plate. Loosely cover it with aluminum foil and wait. After resting, position the steak so the grain -- which resembles thread-like strands running in one direction across the steak -- goes from left to right. Hold the knife about 1/4 inch in from either side of the steak and slice it into 1/4-inch-thick slices across the grain.